Are you a musician in the Pioneer Valley? Think your sound deserves to put on the national map? Well we at The Collective truly believe Western MA is a breeding ground for amazing talent right now, and we want to get you heard. We're also huge proponents of fan sharing, co-writing, cross marketing, and overall artist collaboration. 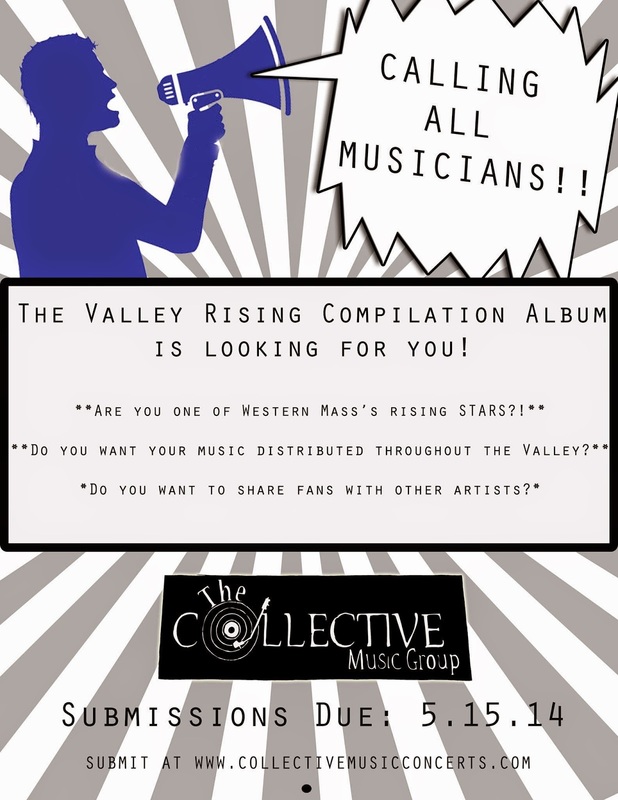 We believe the Valley Rising Compilation Album is a perfect platform for the best local musicians to come together and do all of these things. 10 independent artists will be selected by a panel of judges across the music industry (radio, press, management, booking, etc...), and will be featured on this compilation album to be distributed for free to thousands of music fans throughout western MA, and to members of the music industry in LA, Nashville, and NYC. The album will be released on Sunday Sept 28th at The Iron Horse Music Hall, and all artists will be present to rock the house and share fans! The profits earned from the album sales and the release concert will be donated to the Northampton Community Music Center, an amazing non-profit where many local musicians get their start! SUBMISSIONS DUE MAY 15TH 2014!! 4. What interests you about this project? 5. How many fans do you have on your email list? 6. Tell us one unique thing you're doing as an independent artist to get your music out there. 7. Are you available to perform on Sunday Sept 28th? Are you willing to sell 15 tickets to the show? Fan sharing is huge part of the mission for this project, so we want to pack the house with fans from each artist so you can all grow yourselves in the market and make new fans!